Slap, slap, slap is a sound that may wake you at dawn whilst you are staying in a riverside room at Ahilya Fort in western Madhya Pradesh. 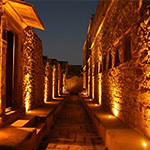 As you peer thirty metres down the impressive side of the fort’s walls, you will see daily life begin. The noise is from women bashing their saris on the stone ghats or indeed men washing their over-underwear. Wearing just underwear – an item which is cleansed by bodily immersion in the sacred river Narmada – is not the done thing in India’s very reserved culture. The Narmada is called the virgin river, and you can actually swim in it, unlike the better-known Ganges which is for the most part too polluted. 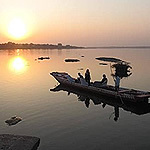 Flowing west for well over a thousand kilometres, the Narmada broadens out in the state of Gujarat before it meets the Arabian Sea. Even if you do not embrace the many gods that Hindus worship, the Narmada has a mesmerising aura, and not just because of the many temples which stand along its banks. 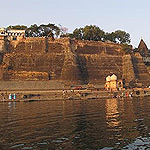 Pilgrims flock to it, congregating in particular at Maheshwar where the fort stands. Apparently, just the mere contemplation of the Narmada can absolve you of your sins. 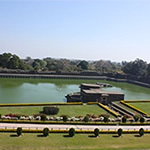 Besides the river activities there are excursions from here to such dramatic sites as Mandu and its 15th century palaces. The sophisticated water-purification systems are a wonder in themselves, and you can marvel at the impressive Dilwar Khan’s mosque. But Ahilya Fort beckons you back. 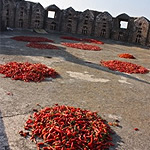 It is run by Aimée, a gentle French-American woman, whose name ‘beloved’ seems to fit perfectly here; she is assisted by Kunta Bai, the owner Prince Holkar’s former nanny who decides on which of the many varying vantage points about the fort one will eat. She gently nudges you to your allotted table and encourages you to mix with the other guests, but there is nothing so tiresome as formal western introductions here. Richard Holkar is a gourmet and loves creating new recipes. Sometimes his superb chef brings out dishes for testing; if approval is given or an adjustment to the taste has been made satisfactorily, the guests will then partake of them at dinner. 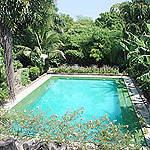 Most of the produce is from the organic garden, and the vegetable dishes are especially imaginatively made. The emphasis is on Indian food adapted for the European palate. It is really outstanding. My last evening just had to be on the river. Aimée and Kunta Bai arranged for a few guests to be gently paddled upstream. On one side was a drinks boat from which excellent G and Ts kept coming; on the other musicians played suitably soothing music. As it got fully dark we saw ahead hundreds of candles floating on the still Narmada waters. Once amongst all these pin-pricks of light one was transported to a truly enchanted place under the stars. You could easily stay here a week if you wanted a gentle Indian experience and perhaps link it with tiger-land, Rajasthan or my favourite Indian beach place in Northern Kerala. 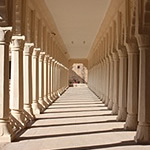 Earlier in my journey I visited some wonderful hotels in Rajasthan. One which was definitely off the beaten track was called Ranvas. A small hotel created from the former Queen’s Palace in the Ahhichatragarh Fort, it contains ten havelis with royal suites that have roof terraces with incredible views across the domes and turrets of the King’s Palace next door. The extraordinary thing about staying here is that you have much of the fort to yourself. Set in thirty-six acres, the ramparts date from the 12th century. At dusk, I walked along the entire circumference of the ramparts, some 1.8 kilometres. On the other side of the wall is the town of Nagaur. As the sun was going down I looked out over the neighbouring rooftops to see masses of children playing with their kites on their flat roofs. Some kites had their lines snapped and landed within the fort enclosure to be retrieved by helpful hotel staff. It was a scene straight out of The Kite Runner and provided another magical evening on an Indian journey. Do let me know if I can arrange a fantastic holiday for you in India or if you are thinking of going on a safari in the school summer holidays. Now is the time to book as August availability is quite limited.